This is not a picture of Aunt Gloria today. It was taken a few years ago, when she was younger. I’m 60, so she was 15 when I was newly minted and 18 when I first became fully aware of anything. So, my first recollection of her goes only as far back as this photo and the fishing trip to Sheepshead Bay. That was in 1957 when I was 3. I look different, but Gloria still looks and sounds the same to me. In my mind we took a car; probably stolen; to the Bay. We parked and walked out on one of the piers to fish. My brother wouldn't; or perhaps couldn't; bait his hook. He was almost 2 years older than me and already setting a poor example of the role an older brother should play in the development of his younger sibling. No matter; Aunt Gloria was up to the task of assuming the role of big brother if necessary. She was different than my other Aunts. You always felt safe with Gloria, never threatened. She always had something funny to say; even at funerals. Wait; make that especially at funerals. Anyway, on this day in Sheepshead Bay, she picked a nice long wiggling bloody worm from a Chinese food container; which is how bait was sold back then; and then swung it before my brother’s face, making him squirm like a worm, and making me laugh like a hyena. Then, after traumatizing him for life, she plunged the hook gleefully into the worm, hitting it mid-section and causing the little fellow to double over. Then she cast the line into the Bay and in short order we hooked a baby carriage, a boot, and finally a huge horse shoe crab. Eventually we did catch some fish; or maybe bought them; to take home. This is one of my earliest memories of going anywhere without my parents. There would be other outings and adventures. 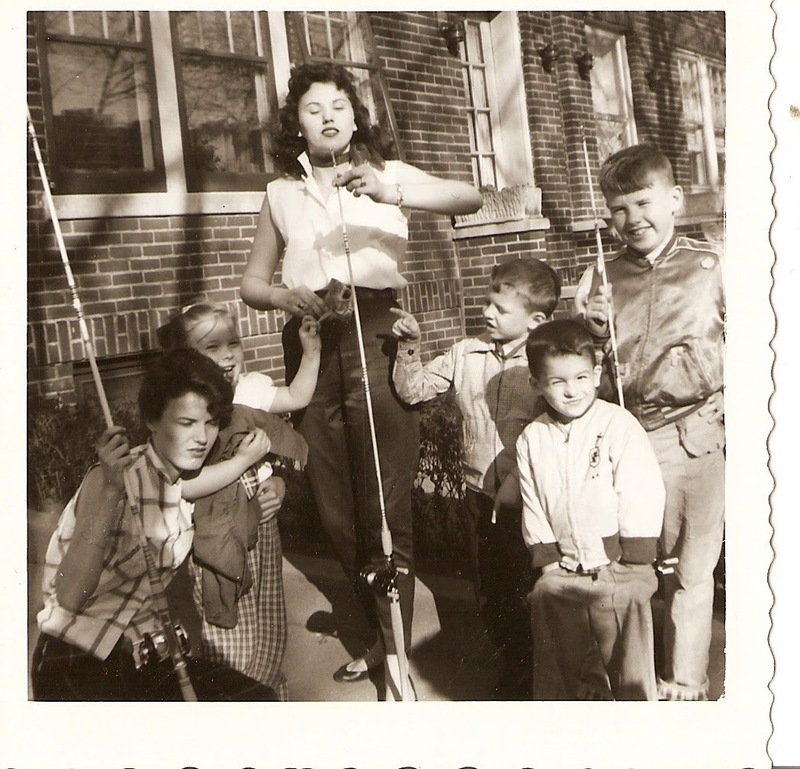 There were Telephone Company ball games; both Gloria and my other Aunt Gladys both worked for Bell; there were days and nights in a bungalow at Breezy Point; movies and just a lot of fun whenever she was around. My Mom was always ill and for 2 summers in the mid 1960’s she and her husband Bobby were like a refuge for me. So, all my memories of Gloria are all fun memories. And that’s why I don’t really see her as having gotten any older through the years. She’s like her own force of nature. Hell, she won’t even see this until she gets back from the cruise she’s on. She’s always on cruises and has probably logged more miles in the Caribbean than I have in all my travels around the world. She still swims every day, although hopefully that will not be necessary on this cruise.